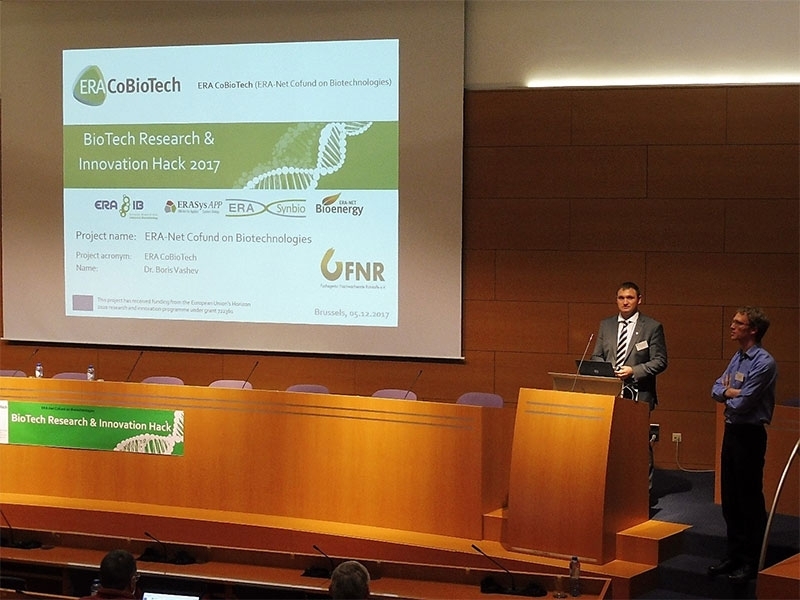 The BioTech Research & Innovation Hack 2017, a status seminar and exchange event for transnational R&I projects funded in the framework of ERA-IB-2 (ERA-Net for Industrial Biotechnology 2), ERASysAPP (ERA-Net for Applied Systems Biology) and ERASynBio (ERA-Net for Synthetic Biology) and ERA-Net Bioenergy organized by the Agency for Renewable Resources (Germany), took place on 5 and 6 December 2017 in Brussels. Coordinators or representatives from 24 research consortia presented their main achievements from the last three years collaborative work. Furthermore, 18 projects in the mid-term phase presented their progress in a guided poster session. The attendees had benefits from the special speed networking session allowing them to get to know researchers from academia and industry, funders and policymakers and to spark novel partnerships and possible collaborative projects. Guest speakers representing coordination and supporting actions such as European IPR Helpdesk, CommBeBiz and KETBIO gave an overview about their projects and the possibilities to support research projects in terms of intellectual property rights, communications and pacing the exploitation and commercialization of project results. In a panel discussion with the topic “Biotech for competitive and sustainable Industrial innovation” experts from ERA-IB-2, ERASysApp, ERASynBio, industry and funding organizations discussed the current developments in biotech research and necessary steps in order to maintain the European position in this domain and to ensure the free transfer of knowledge and technologies across borders. All participants agreed that ERA-Net is a very important instrument, not only for providing funding for transnational research but also to build bridges between researchers from different European countries. The participants therefore appreciate the planned activities of ERA CoBioTech, which build upon the achievements of ERA-IB-2, ERASysAPP and ERASynBio.